Applying for a business permit in Nairobi county can be a cumbersome process especially if you don’t have connections. Well, you don’t have to worry anymore. In this post, I have summarised the entire process in 3 simple steps. Side Note: The processes for obtaining a business permit is the same but varies in terms of cost which is directly proportional to the type, size, and location of the business. 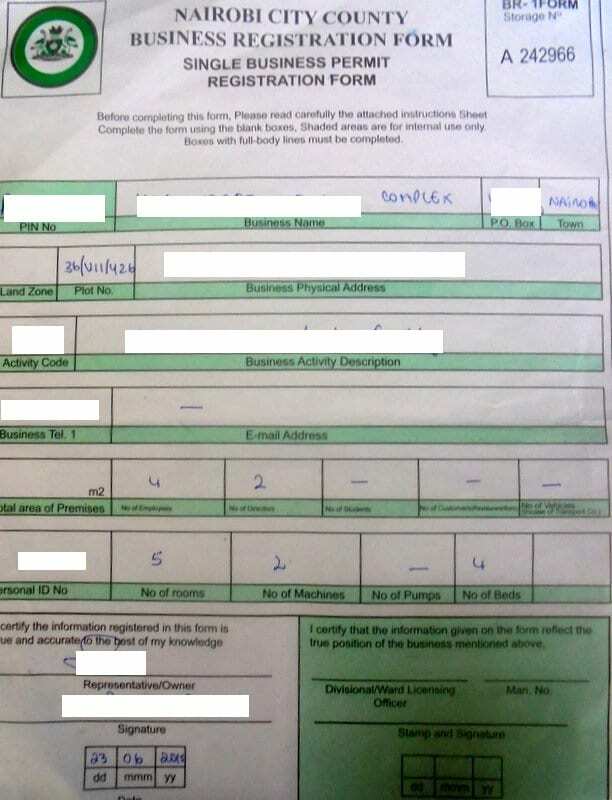 Obtain and verify a business permit application form. Collect invoices for various business license fees. Pay your license fees and get your business permit certificate. Ask to be directed to the customer care unit licensing department desk to make your inquiries. But first, you need to have the following documents with you. Both original and photocopy of a certificate of incorporation. A photocopy of your national identity card or one of the directors. Once you get hold of your business permit application form, Provide the required information by filling in the requested details in the form. Next, move on to the Data Capturing- licensing department within the same building. You can again ask for directions in case you forget your way around. In this department, you’ll only be required to produce the originally approved business permit application form in order to obtain an invoice for the business license fees. Now, let’s pay for our permit. Stroll over to the cashier section armed with your permit payment invoice together with payment invoice. After you’ve made the payment your business permit together with a receipt will be printed and handed over to you in 10 mins time. That is it folks, quite manual and analog. Who wants to walk in kanjos’ offices? Let’s do it the digital way aka online. You intend to open a business hence you require a permit. You had to pay a special visit to your respective ward office to obtain a BR-1 form. After that, you fill the form and take it back to the ward licensing office. The report collected by the team was then used to determine the fees for the permit. If approved, your BR-1 form is stamped and you’re again referred to City Hall for further approval and data logging into the city’s database. Quite hard and time-wasting ha? Click on this link to find out how you can do it from the comfort of your living room. Remember normal Mpesa charges apply. To renew your business permit online first, you need to register on the Nairobi city-county self-service portal. You only need your contact details, national ID or passport number for foreigners. Visit the Nairobi County self-service portal or click this link for direct access. If you don’t have an account yet, click on the signup button at the bottom of the page. To sign up, enter your personal details in the field provided and create a memorable PIN. Proceed and login if you’re a returning user. On the LHS under the home tab, Hoover your mouse over the “Unified Business Permits” tab and click on the + to expand. Read and accept the terms and conditions specified. On the next page, enter your Business ID and select the year you wish to renew.